It makes me want to hug them! I'm really glad you like it ; v ; It was a pleasure to work with them! 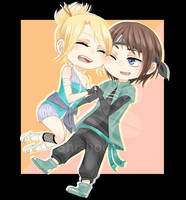 What a freaking cutie chibiiiiiiiiiiiiiiiis!! Thank you, thank you very much to do this!! And thanks to canela2000 for ask my girly for her kiriban prize!! I LOVE THEM SO MUUUUUUUUUCH!! And you're very welcome, I'm so glad you like them!